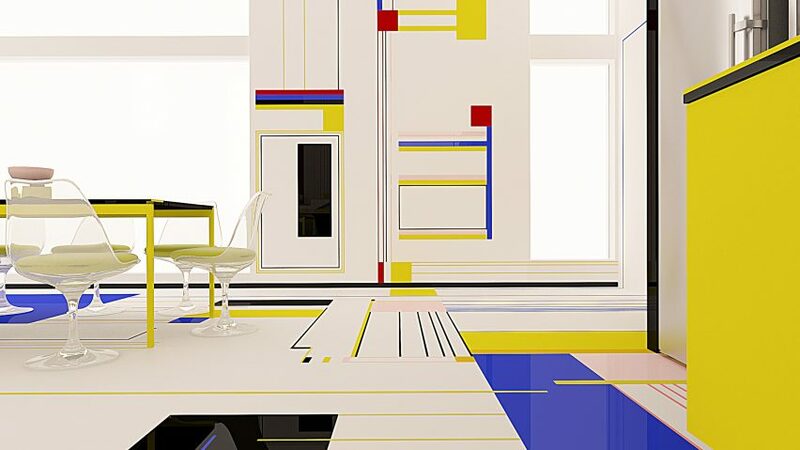 Bulgarian studio Brani & Desi has designed a concept for an apartment that would translate Dutch artist Piet Mondrian's abstract paintings into 3D form. Mondrian's art is often connected to his love of dance and achieving perfect harmony between forms, lines and colours. Brani & Desi, headed by identical twin sisters Branimira Ivanova and Desislava Ivanova, wanted to translate the feeling of unity conveyed in Mondrian's paintings into the design of an open-plan apartment. "In our project we want to evoke the same emotions [as Mondrian's paintings do]," said the sisters. "Through lines and colours, the inhabitants and their guests should feel as though they are part of a dance." "In the dance between forms and colours we use the white and black colours as intervals between the steps. The white is active, the black is passive," they added. "For this project, our aim is to use Mondrian's philosophy to show the importance of having a living space for a healthy life. By 'a dance' we mean harmony between mind, body and soul. A dance is a form of freedom." "The meaning is that the kitchen cannot be without the dining room, or living room," the Ivanovas explained. "As in nature everything is connected and cannot exist without its connecting parts." "It would be great to have the opportunity to implement this design, but it was not the aim in this case," they added. "We wanted to experiment with shapes and colours and their impact on humans."